Vaisala Differential Pressure Transmitter PDT101 is designed especially for demanding life science and high technology cleanroom applications. The PDT101 transmitter is ideal for incorporating into the Vaisala Veriteq Continuous Monitoring System to measure and monitor the critical environmental parameters as required in regulated environments. The PDT101 offers high accuracy, sensitivity and stability with accuracy 0.40% of span providing a highly reliable and repeatable measurement. The sensor uses a micro-machined, ultra-thin silicon diaphragm which provides inherent sensor repeatability and stability. The sensor enables precise measurement and control in high performance cleanrooms. The PDT101 transmitter is available with voltage output (3-wire) or current output (2-wire). Zero and span adjustment screws are available on every PDT101 model. Both adjustments are accessible from the front of the unit. The PDT101 is suitable for high performance cleanroom environments in the life science, semiconductor and electronics industries. As part of a continuous monitoring system, it is highly suitable for regulated environments where continuous, documented and redundant data is a requirement to meet FDA regulations. The compact design is well suited for mounting in a cleanroom or in the adjacent corridor with LED indicator lights for quick and easy power status spotcheck. Vaisala Differential Pressure Transmitter PDT102 is a high performance instrument designed primarily for life science and high technology cleanroom applications. The front panel includes zero and span adjustment potentiometers for convenient adjustment. The PDT102 transmitter is ideal for incorporating into the Vaisala Veriteq Continuous Monitoring System to measure and monitor the critical environmental parameters as required in regulated environments. The PDT102 offers very high accuracy, sensitivity and stability with two options for accuracy, 0.25% or 0.50% of span providing a highly reliable and repeatable measurement. The sensor uses a micro-machined, ultra-thin silicon diaphragm which provides inherent sensor repeatability and stability. The sensor enables precise measurement and control in high performance cleanrooms. 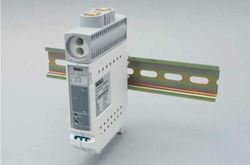 The PDT102 transmitter is available with voltage output (3-wire) or current output (2-wire). Online monitoring of the PDT102 is simple using the optional process valve actuator and the front access test jacks. 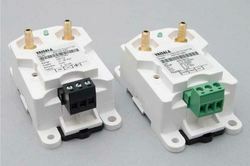 The front access test jacks provide online process reference signal or calibration signal without disconnecting power supply wiring. Measurements can be made using a standard multimeter.